The Advent Market is open from November 26 to December 22, from 11am to 9pm (10pm on Saturdays). For many, the prettiest square is Kornmarkt. Children love to explore its Winter Woods (Winterwäldchen), where the white tents and 100 sparkling Christmas trees create a Grimm’s Fairy Tales-like atmosphere. For small children, Universitätsplatz, the largest square, is a must, with its 100-year-old merry-go-round, complete with prancing horses. Show off your skating skills on the temporary ice rink on Karlsplatz square. One of Germany’s most beautiful outdoor skating rinks, it has a magical view of the castle in the background. Glide and pirouette to the music, then warm up with a hot drink: a mug of steaming mulled wine or special alcohol-free punch for children. Plus, of course, a traditional treat from one of the food stalls! The Ice Rink is open from November 26 to January 6, 2019, from 10am to 10pm. Monday December 3: The gay community marks Advent on December 3, when Pink Monday Heidelberg raises money to fight AIDS. For one night only, major sites are illuminated in pink, from the Town Hall to the Church of the Holy Spirit (Heiliggeistkirche). There is also pink mulled wine, served in collectible, limited-edition mugs. Thursday December 6: St Nicholas Day is traditionally the day for giving children their Christmas presents. At 5pm, youngsters can join Santa and an angel on a special tour of Heidelberg Castle! Fred. 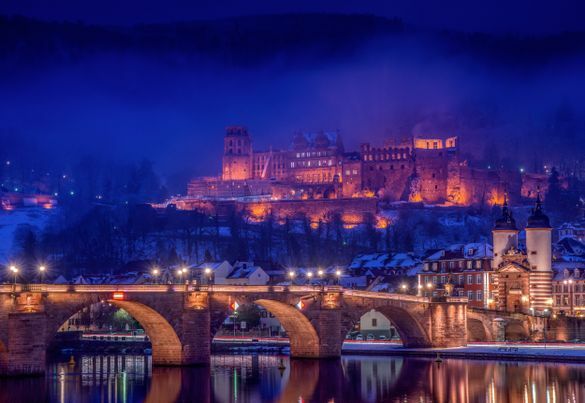 Holidays (0800 988 3369; fredholidays.co.uk) offers Heidelberg city breaks during the Christmas market season for 3 days/ 2 nights from £349, including flights and 4* Hotel with B&B (based on two sharing) and rail transfer. By road: Heidelberg is 6 hours’ drive from Calais. By rail: Heidelberg is 7 hours from London by train (www.bahn.com). By air: Heidelberg is 1 hour by train from Frankfurt Airport; 90 min by train from Baden-Baden/Karlsruhe Airport.